This is my first adventure into the RC world and I've decided try building a V-tail quad. I'd appreciate any thoughts and guidance as I learn and build. I've already rushed in and bought some stuff from hobby king. Let me know if I've made any bad choices. I'll be building the frame from ply and 10mm square timber sourced locally. 1. 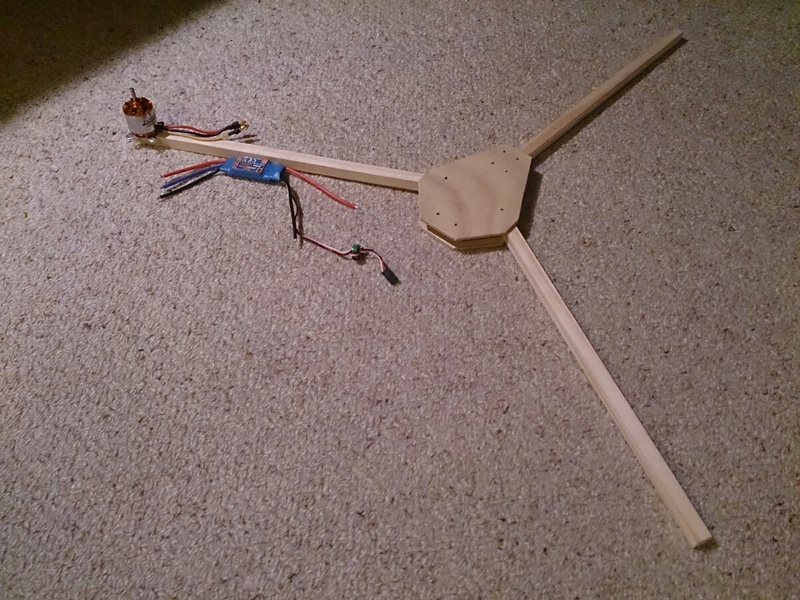 Do I need some counter rotating props for a V-tail quad? I think I'll need the front two props rotating opposite directions and also the same for the rear two? 2. Will I still need an ESC programming card if I'm going to flash the ESCs with the SimonK firmware? 4S battery, on an 1100KV motor, with 9" props is going to be a hot rod. With 4S batteries, the 30A ESC is safer than the 20A. You will need to have counter rotating props on a quad, even in a v-tail configuration. Also make sure when you setup the rear that there is clearance of obstacles (ground, frame, wires, neighboring prop) for the rear props. Typically, for the v-tail builds I have seen, they run higher KV motors in the rear(to offset thrust loss with smaller props) with smaller props (for clearance issues) and even tri-blade props (to give a bit more thrust) versus a "symmetrical" setup all the way around. I don't think SimonK flashed ESC's need additional programming to make the low power cut feature correct for multi-rotors. 4S battery, on an 1100KV motor, with 9" props is going to be a hot rod. Would you recommend I go with slower motors (I've already ordered these motors), smaller props or give it a go with the 1100kv and 9" props? Give it a go, just take it easy on the throttle. Here's the pieces for my frame. I'm using 12mm wooden booms. - Does it matter if the angle between the front booms is greater than 120°? 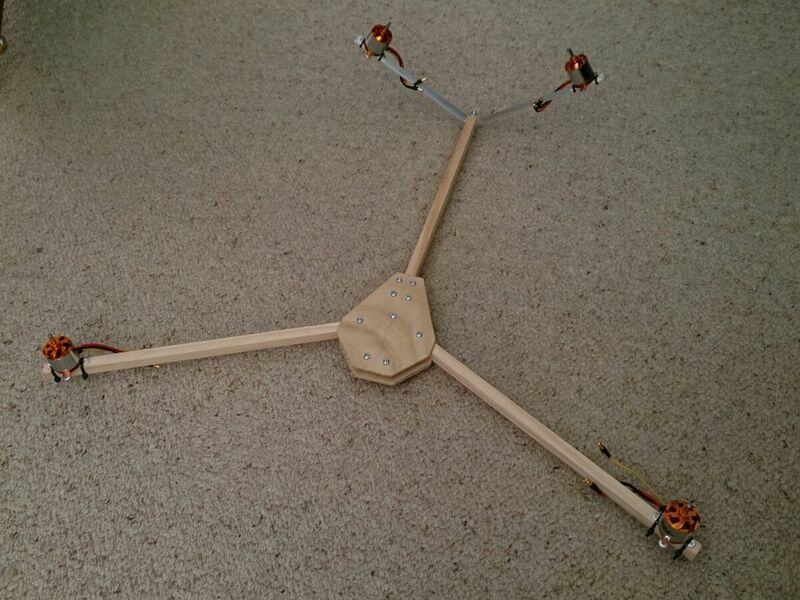 - The front booms are 35cm (nearly 14") long as per David's V2.6 tricopter. This gives about 24" between the front motors. Is that too big? No, it's fine. And a tri with longer booms (within reason) is actually better if you're first learning to fly. It is inherently slower to pitch and roll, so it will forgive jerky input a bit better. My Bat Bone with 10" booms has the motors 23" apart. I would say you're fine at 24" apart. Let us know how it goes flashing your own. I just ordered the flash tool myself for the new hex ESC's. I went with the HK-SS18A 18amp since the 20's are shipping with the reset pin disabled so they are unflashable. I have some redbrick 30Amps for the quad that I might give a shot but I think those might also been disabled for flashing...we'll see! I think you're right. 4S will probably give me too much power and less flight time. My estimate for the all up weight is about 1200 grams. Does that sound reasonable? Is it possible to use the ecalc website for a V-tail quad? I'm bad at weights, hopefully one of the skilled guys can chime in on that. I guess the calc would be a good starting point if nothing else. I mean, it's still thrust, just vectored slightly... I would just set it up as a quad. Again, just a guess that one of the guru's can correct for me if I wrong. I tried making the V-tail section and this was my first attempt. The back motors were cantilevered out too far and the back boom would twist too much. So I've decided to scrap that idea and try a David style setup with the two rear booms and this seems to be much stiffer. Where do you get the latest firmware to the KK board? 1st Post in the listed thread. I'd recommend just using the lazyzero flash tool. I just used it for the first time and flashed my KK2 with 1.6 and 4 ESCs with SimonK firmware in few minutes. Super easy! With my V-tail setup with outwards thrust I seemed to have to reverse the rudder settings in the mixer settings for channels 3 and 4. 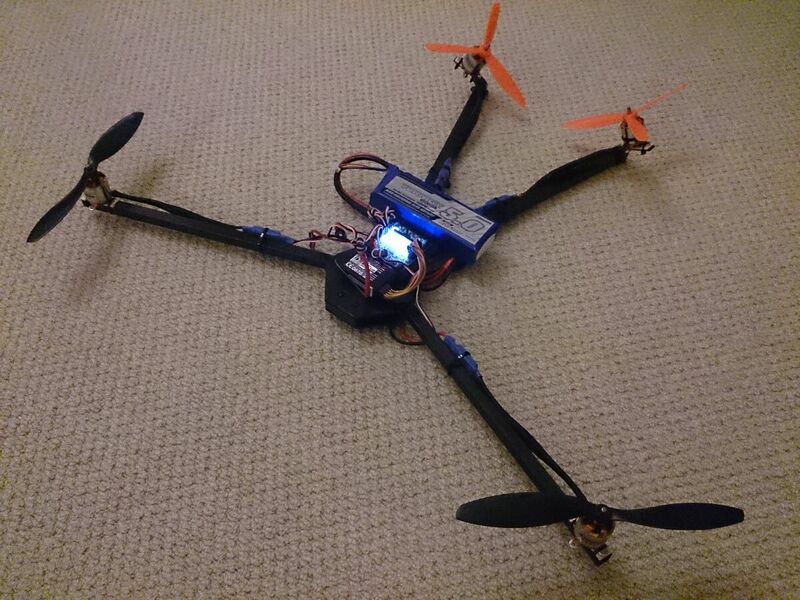 Which props would be best suited for my 1100kv motors? Same motors front and back at this stage. And I'll probably be running from a 3S lipo to start with. At this stage I'm thinking the 10" or 11" on the front and the 7" three bladed props on the V-tail. 11X4.7 Gemfans (sold by Hobby King as Turnigy) are a personal favorite of mine for 800KV to 1100KV as far as cheap props go. Although 3 bladed fans work and I started with them I like the two bladed better. 3 Blades are a pain to balance and I have NEVER had a prop that was balanced out of the package. I agree. Never had a plastic prop even close. 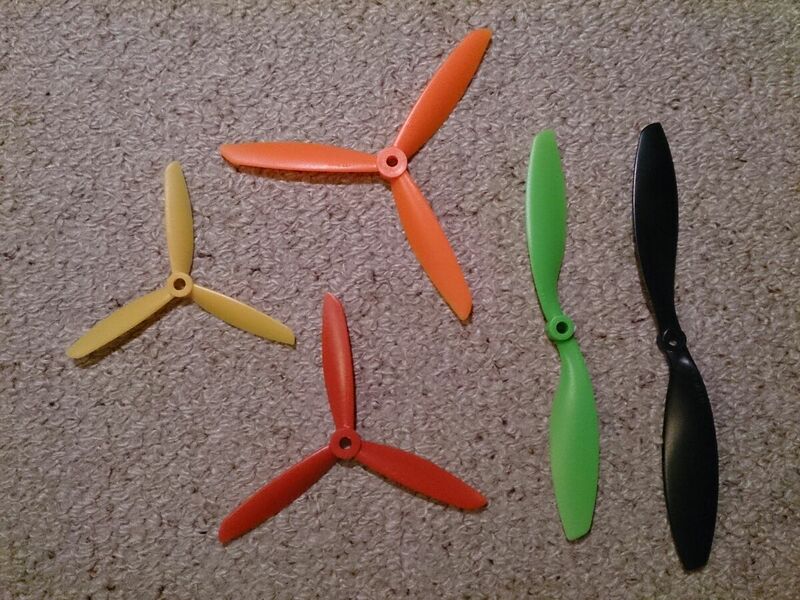 I did buy some carbon fiber props from Rctimer (good deal) that were very close. But they, (or wherever Rctimer gets them) pre-balances. The underside of one side is clearly scuffed. I got some painting done today and started getting it all connected up. The ESCs are calibrated and flashed with SimonK firmware. I had to reverse a few channels on my transmitter and have switched to Heli mode which allows me to adjust the throttle response curve. Hopefully this will make the throttle less sensitive around hover. 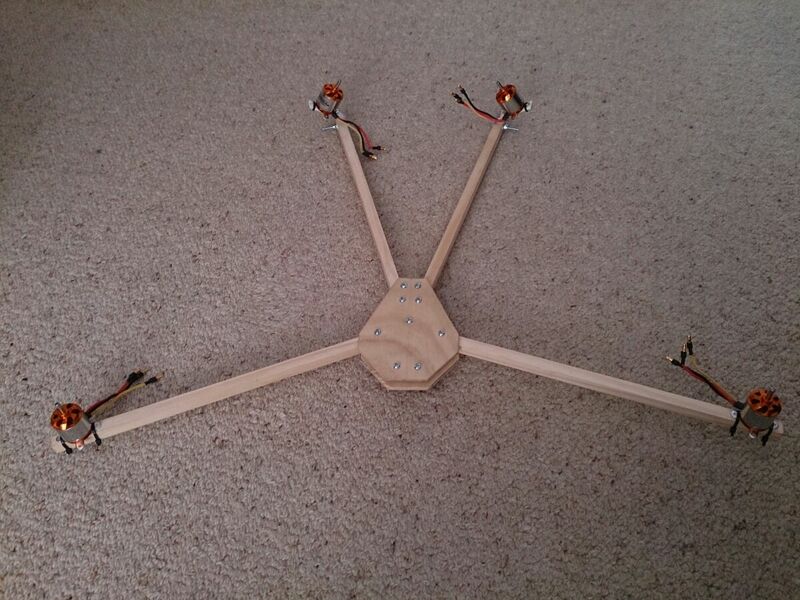 Next step will be to make some landing gear and mount the battery somewhere. 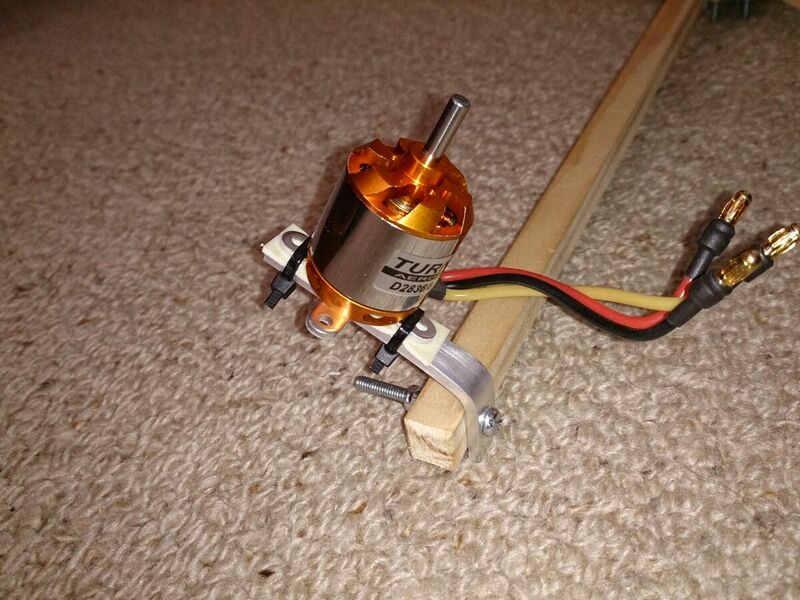 Regarding unbalanced props, I have found that my cheap 'simple prop balancer' from hobbyking is not balanced itself! I think the shaft must be very slightly bent.